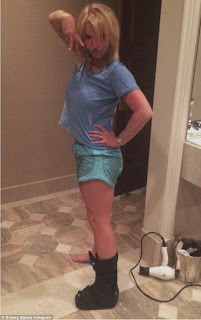 Dr. K. Lam Straight Talk: Britney Spears Sprains Ankle in Vegas show: OOPS she did it. Britney Spears Sprains Ankle in Vegas show: OOPS she did it. Britney Spears was in the middle of her show at Planet Hollywood in Las Vegas when she sprained her ankle. The pop star was performing her hit song “Crazy” when she twisted her ankle and fell (see image). Surprisingly, she handled it very well and finished the song. She was later advised by her physicians to postpone her succeeding shows for her sprain to heal. A sprain is the stretching or tearing of a ligament. A ligament is a fibrous tissue that connects bones, cartilages or hold joints together. There are a lot of causes of sprains. Falling, twisting, or any force that can violently place a joint out of its normal position, causing the ligaments to stretch and tear that may lead to a foot sprain. Signs and symptoms of sprains include pain, swelling and bruising of the affected joint. Immobilization and resting of the injured joint. Your physical therapist may require you to use a special boots and crutches. Apply ice for the pain and swelling. You maybe advised to ice the affected area for 20 minutes for around 4 to 6 times a day. Elevating the foot above your heart can prevent pooling of bodily fluids to the foot and can drastically help reduce swelling and pain.